We most commonly have concrete flooring in our garages, on our driveways, or in our basements. 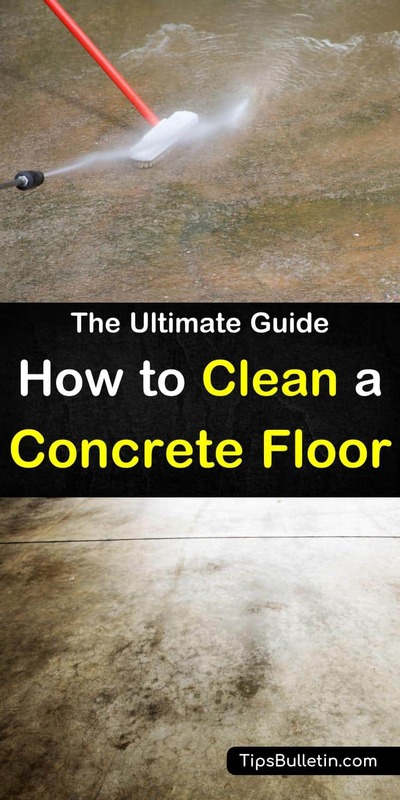 Wherever it is, if you have one, you need to learn how to clean a concrete floor to keep your whole home clean and stain-free. While concrete is extremely durable, it is naturally porous. This means that the concrete can easily absorb liquids and develop stains over time. Unsealed concrete requires extra effort to remove the stain from the surface. Older stains are harder to remove, and you will normally only be able to lighten the stain if it has sat for an extended period of time. Once you learn how to clean a concrete floor, you should clean all your concrete floors once a week to remove stains before they become permanent. Cleaning a concrete floor occurs in stages. First, sprinkle cat litter or sawdust across any grease or oil spots. Let sit overnight so that it has a chance to draw out the oil. Afterward, sweep any debris off the floor with a broom. You will need to use a dust mop after sweeping to make sure that you have picked up any fine particles of dirt or grit that may remain. If you do not have a dust mop, you can also use a vacuum to remove these particles. The next step is to apply powdered dishwasher detergent to the stain. If the stain has already dried, moisten it slightly before using the detergent. Let the detergent soak into the stain for at least 45 minutes. When it has fully soaked into the concrete, pour boiling water onto the floor. Using a stiff brush, scrub the spot thoroughly until you’ve removed most of the stain. Mop the spot with clean water to remove the detergent. Once the detergent has been fully removed, use 2 ounces of washing soda in every gallon of hot water that you put into the mop bucket. Use this solution to mop the entire floor. Once you have mopped the floor, switch to clean water to remove any of the cleaning solution. Use a towel to finish wiping the floor, and you should be finished removing the stain. In the future, using a paint-on sealer on the floor can help prevent future stains and make spills easier to clean up. The basic way to clean a garage floor is the same as the previous method. If there are especially difficult stains, it’s best to use a pressure washer and muriatic acid. Follow the directions on the container for the muriatic acid, and apply it to the floor. Afterward, apply baking soda to the floor to neutralize any acid. Set your pressure washer to 1200 PSI and rinse the floor. If metal objects, machines, or bikes have been sitting in the garage, they may have created rust stains on the floor over time. Rust stains can be easily removed using one ounce of TSP (called trisodium phosphate) in one gallon of hot water. Wet the affected area thoroughly before using the rigid bristles of a broom to scrub it. Afterward, let it soak into the garage floor for 15 minutes before rinsing it off. While you’re working in the garage, it may be a good time to take care of the vehicles, too. Repair and clean a leather car seat, then tackle the outside of the vehicle to have a storage area and auto that are sparkling clean. There are several techniques regarding how to remove oil from the garage or concrete driveway. Small stains can typically be removed with just a scrub brush and strong detergent. For larger spills, a commercial concrete cleaner may be needed. This alkaline soap works like ball bearings to loosen up the oil. The soap does not actually break down the oil though so will not work well for floors that have been heavily contaminated for a long period of time. If a commercial cleaner does not work, you can try using a poultice. This technique works best for smaller stains. Combine the absorbent material with the solvent, and then apply to the stain. Cover the poultice with plastic and give it at least a few hours to break down the oil. Since this technique is effective for smaller stains, it is one of the more effective methods for cleaning oil from concrete countertops. The most recent innovation for cleaning concrete is through cleaners like KT Microbial Products or ESI. These cleaners are made out of single-celled microorganisms that live off of crude oil. The enzymes in the microorganisms eat the oil and transform it into carbon dioxide, and the microorganisms reproduce until all of the oil is gone. When the microorganisms completely consume the oil source, they die and leave the concrete completely oil free. Over time, ice-melt salt and similar products can stain concrete. To prevent these products from harming your concrete in the winter, use baking soda instead. You can also use sand to increase traction. If you do not have any commercial cleaning products on hand, oven cleaner will work just as well. You can use it to remove transmission fluid, grease, and oil stains from your concrete driveway. Allow the oven cleaner to sit for 5 to 10 minutes on the affected area. Afterward, use a stiff brush to scrub the area before rinsing. Ammonia is amazing at removing discoloration from concrete. Scrub the ammonia mixture into the concrete before hosing it down completely. If you get to the stain right away, WD-40 can help to remove oil spots. For immediate spills, pour WD-40 onto the driveway or garage floor before hosing it off with water. For a creative at-home remedy, try using Kool-Aid to get rust off concrete. Blend a package of unsweetened lemonade Kool-Aid into some hot water. Afterward, use the mixture to scrub the rust. For a superior concrete floor cleaner, you can use soda. If you have already used sawdust or kitty litter to absorb oil stains, you can use soda to clean up everything that remains. After sweeping up the sawdust, pour soda on the entire area. Use a bristle broom to work the soda into the ground before letting it sit for 20 minutes. A cleaning solution will clean up the soda. Clean up any remaining mess with a mop dunked in this solution. 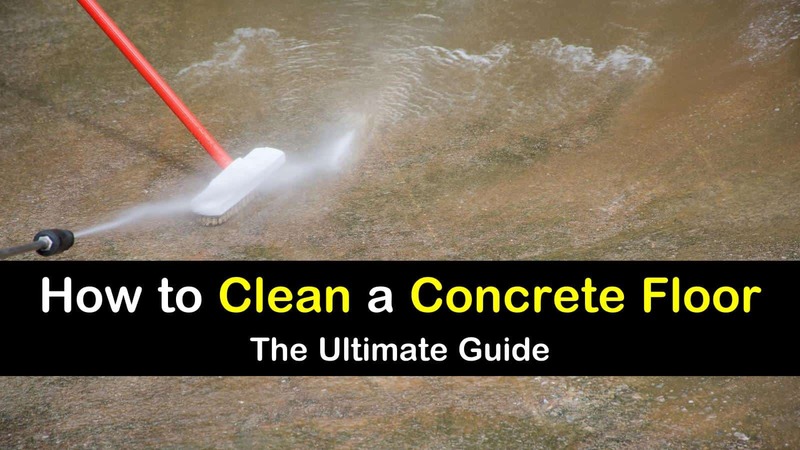 Although some cleaning methods can be time-consuming, you will thank yourself for that time investment when you see your stain-free and grime-free concrete! Now you’ve learned how to clean a concrete floor, don’t forget to clean that floor regularly to maintain the new-concrete look.